Geneva Cross went to be with her Lord and Savior Jesus Christ on Thursday, November 15, 2018, just a month shy of her 90th birthday. 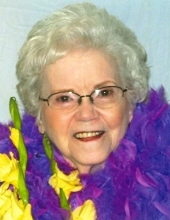 Geneva was born on December 20, 1928 to John and Beulah Welch Garroutte in Porter, Oklahoma. She liked to call herself a “Porter Peach” and a peach she was. She grew up in the Osage and attended Burbank School. When her family moved to Ponca City, she was in the 1947 class of Ponca City High School. On January 25, 1947 she became the bride of Leon Cross and celebrated 57 years as his “darlin’” prior to his death in 2004. During high school and early-married years, Cuzalina’s Drug Store and Ruth Druley’s were fortunate to have her as a sales clerk. She was a homemaker for many years following the birth of her first child. In 1974 she went to work in control accounting for Sooner Life Insurance Company and later became Personnel Benefits Coordinator, retiring in 1990. While there she earned the designation of Fellow, Life Management Institute, specializing in personnel administration. In 1990 she started a medical claims filing service called CrossCare and did that until her husband’s retirement. In addition to her family, she enjoyed crafting, sewing, charcoal drawing, reading nonfiction and gardening, becoming a Master Gardener in 1994 after completing an Oklahoma State University extension course. Her beautiful flowerbeds were featured with full color pictures several times in the Ponca City News. Prior to Leon’s death they did some traveling, both on their own and with their grandchildren. Geneva served her community and church with willing hands and heart. She served on the Ponca City Park and Recreation Department for 3 years. As a member of First Lutheran Church, she was part of the Lutheran Women’s Missionary League and the Altar Guild and loved delivering homemade birthday cakes to shut-ins. If she could have, she would have been part of the card ministry, helping to put joy and love in the lives of other shut-ins just as she enjoyed the many cards they made for her. Learning Tai Chi was a challenging but enjoyable hobby in her senior years. In the last nine years, Geneva had been a resident first at the Renaissance Assisted Living Center and later at Via Christi Nursing Home. She was well loved by the staff at both facilities. Always more reserved until her senior years, she rediscovered her delight in dancing, even with her walker, and was named valentine queen at the Renaissance. She loved to explore the hallways of Via Christi and put a smile on everyone’s faces. They found her to be very happy and easy-going. Found in her files, in her handwriting, was this note, “The only love you can take with you is the love you give.” She gave love well and to many. She is survived by one son, Brian Cross and wife Charla of Ponca City, one daughter, Vicki Wasson of Ponca City; three grandchildren, Jeff Jones and wife Jennifer of Edmond, OK, Matt Maudlin and wife Heather of Spring, TX, Lindsey Wasson of Dallas, TX; three great grandchildren, Abby Jones of Edmond, Aubrey and Cooper Maudlin of Spring, TX; one sister, Chris Gaddis of McKinney, TX, three brothers, Wayne Garroutte of Carney, OK, James (Buddy) Garroutte and wife Carolyn of Hot Springs, AR, John Garroutte and wife Jerene of Grand Island, NE; two sisters-in-law, Jean Kobs of Oklahoma City, OK, Shirley Farrington of Tahlequah, OK, one brother-in-law, Gary Cross of Sachse, TX; and numerous nieces and nephews. She was preceded in death by her parents, her husband, son-in-law, Richard Jones, daughter-in-law, Lisa Cross, her sister, Doris (Dusty) Garroutte, her sister-in-law, Mable Miller, and her brother-in-law, Harry Cross, and several nieces and nephews. The funeral service will be at 2 PM on Tuesday, November 27, 2018 at First Lutheran Church with Pastor Jeremy May officiating. Burial will follow at Odd Fellows Cemetery. Casket bearers are grandsons, Jeff Jones and Matt Maudlin, niece, Jami Fenner, and Mark Evans, Jay Laramy, and John Bley. Arrangements are under the direction of Trout Funeral Home & Crematory. Public viewing at Trout Funeral Home will be held Sunday, November 25th from 3-8 PM and Monday, November 26th 8 AM-8 PM. Visitation with the family will be Monday evening, November 26th from 5-6 PM. A memorial has been established in Geneva’s memory at First Lutheran School. To send flowers or a remembrance gift to the family of Geneva Helen Cross, please visit our Tribute Store. "Email Address" would like to share the life celebration of Geneva Helen Cross. Click on the "link" to go to share a favorite memory or leave a condolence message for the family.